Many troll-moons ago, Molda-the-Mystic-Ancient-One created the Blue Flame. Dee Flamoo-Bloo ~ a flame of great power and unbelievable beauty. When it is seized by the Lost Imps, the trolls fear it is gone for ever. Snorrie Magnus, the twin-headed troll, is an adventurer with a tale to tell. When the King of Trolls mysteriously loses his voice, his quest to find the missing Flamoo-Bloo begins. It is fraught with difficulty and danger. His mission leads him to encounter various deadly foes, from the wicked Queen Faerie, to Miasma the mermaid and Ormarr the Odoriferous, meeting fire-furies and a dreaded Big Man on the way. His journey takes him from a secret castle on the mountainside, through emerald forests of spiteful laughter, along rushing rivers to the depths of the Argassian Sea. However, finding the Flamoo-Bloo is only part of his problem. Will Snorrie Magnus survive his quest? Will the Troll King ever speak again? 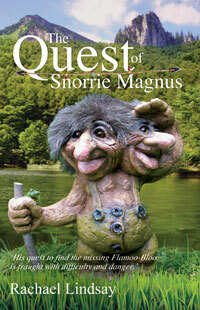 Find The Quest of Snorrie Magnus on Amazon or directly from the publisher, Pegasus Elliot Mackenzie.